A liquid solar blanket is a molecule-thick blanket of a lighter-than-water substance that is used in a swimming pool to save on heating costs by preventing evaporation. It replaces the traditional insulating pool cover, which reduces heating costs by preventing heat loss. Evaporation prevention is an effective means of lowering heating costs because changes of state (solid to liquid to gas or vapor) are high heat consumption phenomenon. 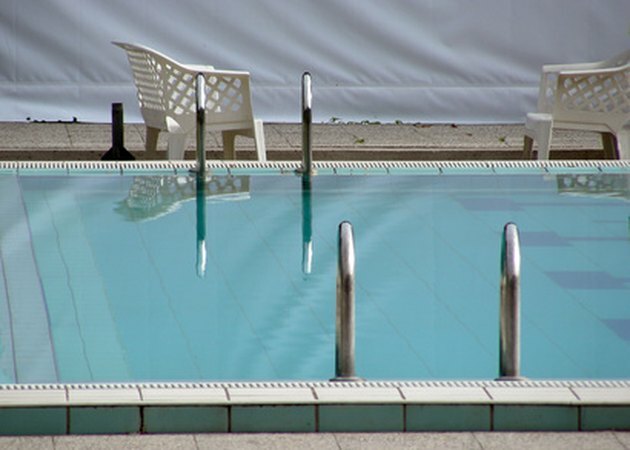 According to tests conducted by the Professional Pool Operators of America, a liquid solar blanket applied once a day is 75 percent as effective as a hard pool cover. Liquid solar blankets are one molecule thick. Purchase a supply of stearyl alcohol of not less than 95 percent purity. This inexpensive substance is a solid, waxy vegetable oil available from most chemical suppliers. It comes in granules or flakes. Your liquid blanket requires 1/20th of an ounce per 500 square feet of surface area per application. Purchase a supply of isopropyl alcohol, commonly called rubbing alcohol. You'll need 19/20th of an ounce per 500 square feet of surface area per application. Pour 8.5 ounces of isopropanol into a glass jar with a screw-on lid. Pour .5 ounces of stearyl alcohol flakes or granules in the jar, and screw the lid on tight. Shake vigorously until the stearyl alcohol and the isopropyl alcohol are completely blended. Apply to the water by dribbling the mixture along the length of the windward side of the pool at a ratio of one fluid ounce per 500 square feet of swimming pool surface area. Lyle Burwell has been writing professionally since 1978. His “Call Centers in the New Millennium” (ICM Global Intelligence (1999)) was the most checked out volume in the AT&T corporate library in 2000. His areas of expertise include business strategy and telecommunications. He has a diploma in broadcasting from Algonquin College. When Should I Apply Weed & Feed to St. Augustine Grass?